June « 2015 « Geekorner-Geekulture. It’s been quite a season for OreGairu, hasn’t it? But here we are, 8 AM on a Saturday morning, all ready to watch the finale. I’ll leave talk of the season as a whole for the post-episode/season write-up, but man, this is the season where all the things left unsaid in the first season were said, and acted upon, and drama and the quest for maturity were embarked upon in earnest. So what did we have last episode, that was filled with notable scenes? I’d say the most common refrain was Haruno’s jealousy of Yukino (because “I hate [x]” in this show is now code for “I’m jealous of them”), and how she kept meddling. That’s on the plot-level. Thematically, it was all about how we handle our self-image in the face of expectations, how we think others expect us to behave, and trying to navigate between our image for ourselves, and the image we think others have for us. Yukino, Hachiman, and the rest, are all dealt a blow when they realize they’re “not being genuine,” by their own definitions. And it seems as if Yui is going to take matters into her own hands, one way or the other. She’s always been the one driving everyone forward. We’ll have to see how it shakes out, and at what cost. Everybody hurts, and that’s what relationships are like. Ok, we’re going to start with the post-episode write-up and then a short something about the season as a whole. Just so you’d know how this section is going to be organized. This episode was relatively quiet, as many of this show’s second half has been, with one half being relatively light and quiet and “easy”, and the other half being more “impactful”, or “heavy”, if you wish. But while nothing much happened on the surface, the whole water park trip was fraught with constant allusions by the characters to themselves and one another, by way of the marine animals. This isn’t something that was just “happenstance,” not even merely the author using this angle to have the characters comment on things. No, it’s the characters trying to act as if everything’s “normal”, and as episode 3’s write-up spent a lot of time talking about, it’s a lie, and when everyone knows it’s a lie, then everyone is uncomfortable, and things leak out. There’s also the other side of it here, which is that the characters want to be understood (while also fearing it), so they keep dropping hints and waiting for someone else to make the first move for them. 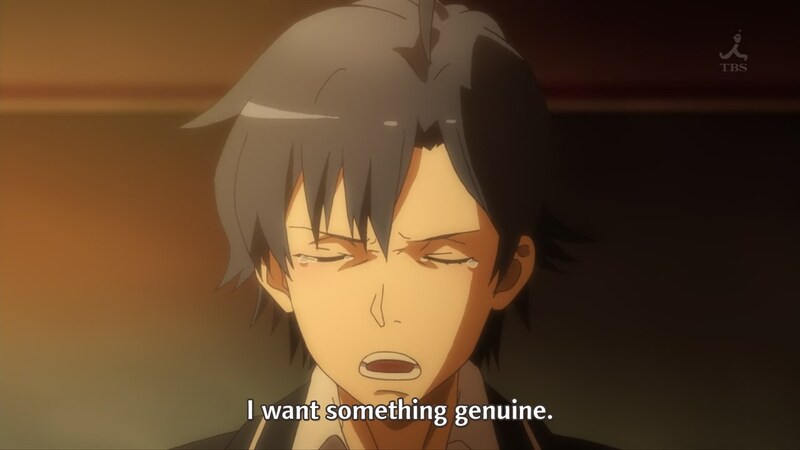 54 Comments Posted in anime, Episodic Notes Tagged My Teen Romantic Comedy SNAFU, OreGairu, OreGairu S2, OreGairu Zoku, Yahari Ore no Seishun Love Comedy wa Machigatteiru. I really enjoyed last episode, where the focus was on Hayama, with his own troubles, with his own humanity, and dignity, and trying to do the right thing where everyone, including himself, is happy. He knows there are no magic solutions, but he’ll try. He knows who he is, and he owns it. He’s more mature than most of the rest of the cast, but he’s still trying. Hayama is jealous of Hachiman, just as Hachiman is jealous of him. It’s much easier being jealous of masks when you don’t see the situation from inside someone’s mind. We all have our crosses to bear. Heck, last episode was filled with moments of people carrying their own crosses, full of great scenes, with Miura’s confession of weakness and caring, to the Haruno scenes, to Iroha and Yukino. But where are we now? 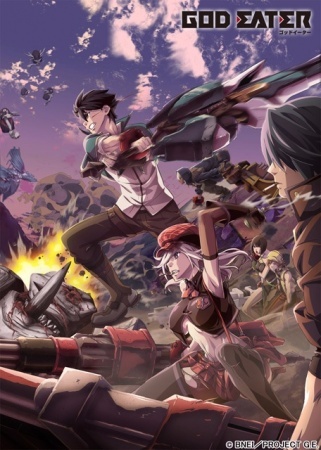 Well, done with novel 10, so no more LN-reader spoilers/teasers/complaints. New material for everyone. So, what are we going to have? Hachiman is still growing up, he’s still using his Hachimanism to get things done, but he knows it is a tool, and a dangerous one at that. We have the group of friends living life together, and we still have Yukino’s home situation, looming around behind every scene, every moment where she’s shown for the last 3 episodes, and also in the background of much more content. Will we keep exploring Hayama’s “arc”? I suspect not, his thematic arc feels “done” for the moment, but we’ll still see its ramifications, because that’s life. Being understood, being labeled is scary. As scary as being misunderstood? Before this episode was over I was going to comment on how this episode continues the trend of most episodes since episode 8, where one half is pretty light, but then there’s one half, or at least parts that are much more light-hearted. Well, it’s certainly true, and the Waifu Wars or Waifu Bowl had certainly had a go at it this episode, with Yui, Iroha, and Yukino all acting seemingly protective over Hikki, and Hikki showing some purported interest in Iroha and Yui, and of course Hayama and his followers, and the two “anime-ism jokes” thrown in for good measure (Ebina and Totsuka). 12 Comments Posted in anime, Episodic Notes Tagged My Teen Romantic Comedy SNAFU, OreGairu, OreGairu S2, OreGairu Zoku, Perception of Self, Yahari Ore no Seishun Love Comedy wa Machigatteiru. So, subtitles of unproven provenance, after I woke up 14 hours ago for an episode that did not arrive, and these subs went unnoticed by me for 3 hours. Welp. Anyway, last episode for the most part was a continuation of the episode that preceded it, with busy Hikki going on essentially 3 dates in one episode, and there being the long-awaited smackdown of Tamanwa, and Iroha finally taking charge of her Student Council, and although nice, the true focus of that scene was where Yukino and Hikki spoke to one another and of themselves, and Yukino did not let Hikki sacrifice himself once more while stepping back. And then, fitting for Yukino’s little speech about how you can’t progress without speaking clearly and being willing to be hurt, we finished the episode in an extremely uncomfortable position, with Yukino and her mother not-speaking in front of everyone else, and no one knowing what to do about it. Hayama Hayato is a character I like. It’s how somber he is, how much you can see he’s hurting, and how hard he’s trying, trying to not hurt, trying to make sure everyone else is alright, trying to be the best person he can be, while hurting, and not knowing what the “right decisions” are. So what does he do? The only thing he can do, his level best. 18 Comments Posted in anime, Episodic Notes Tagged Maturity, My Teen Romantic Comedy SNAFU, OreGairu, OreGairu S2, OreGairu Zoku, self-reflection, Yahari Ore no Seishun Love Comedy wa Machigatteiru. So, last episode was, rather than a return to normalcy, our cast taking their first step on their renewed path of togetherness, friendship, and willingness to be hurt, it also had a lot of fun and shipping-ammo moments. Yui told Hikki she wants to spend time with him, Yukino told him she was envious of him, and Iroha confessed to Hayama who turned her down. All the girls revealing of themselves and trying to bridge the gap. 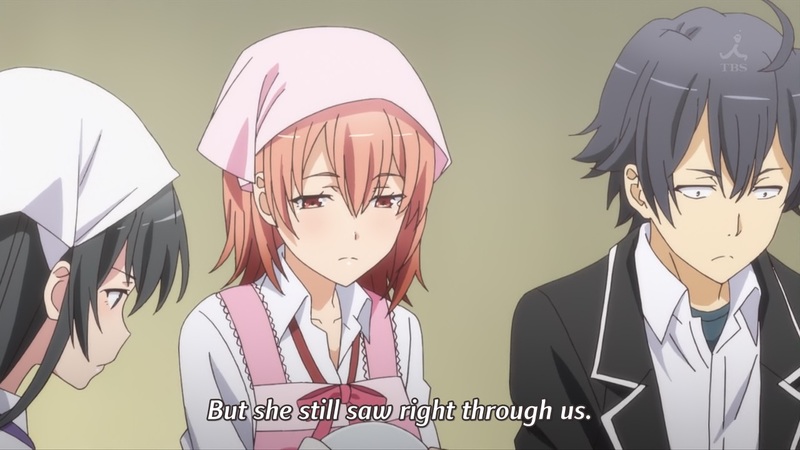 Now we still have a party for the elderly to organize, and the party and emotional repercussions of Iroha’s confession – let us see what Hachiman deprived Tobe and Ebina of in the 2nd episode. The quest for genuine continues, and the maligning of everything else as fake. The post-ED segment dovetails perfectly into what I wanted to open this discussion with. In my weekly round-up where I covered episodes 8-9 I pointed out that in most movies, series, and books, episode 8 would be either the final shot, or the one preceding it and the denouement, if it weren’t one that actually came up early. 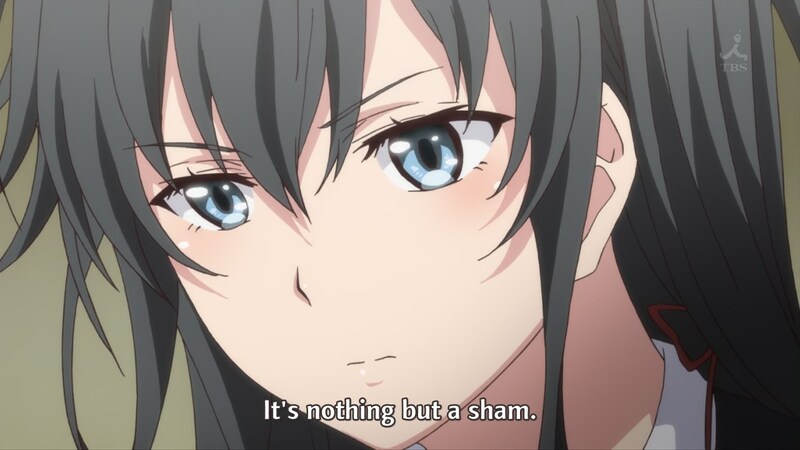 It’s the conclusion of a long journey Hachiman has been undergoing since before the series even started, from knowing he’s miserable to admitting it and then acting on it. But it’s also the start of a new journey, because as the final catalyst for the change and the episodes since have kept pointing out, it’s the actual effort you make that brings about change and is worthwhile. “Yay! I need to change!” is only the start. 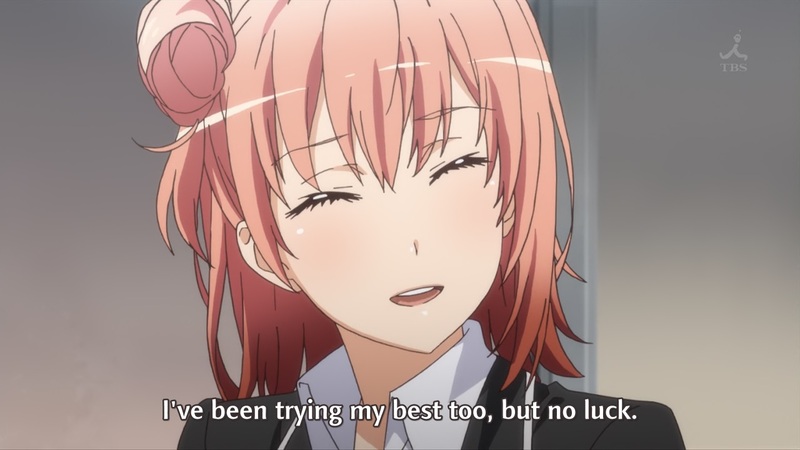 15 Comments Posted in anime, Episodic Notes Tagged My Teen Romantic Comedy SNAFU, OreGairu, OreGairu S2, OreGairu Zoku, Yahari Ore no Seishun Love Comedy wa Machigatteiru. Still busy with real life schoolwork, but here’s what I think of the past two weeks’ worth of anime episodes I’ve watched. Still need to catch up on Sidonia, but hey, we watch what we can! Some stuff was great, and some stuff was terrible, that’s how this season is. Episode 8 was the dramatic core of the entire show up to this point. This is the big conflict everything was building towards. 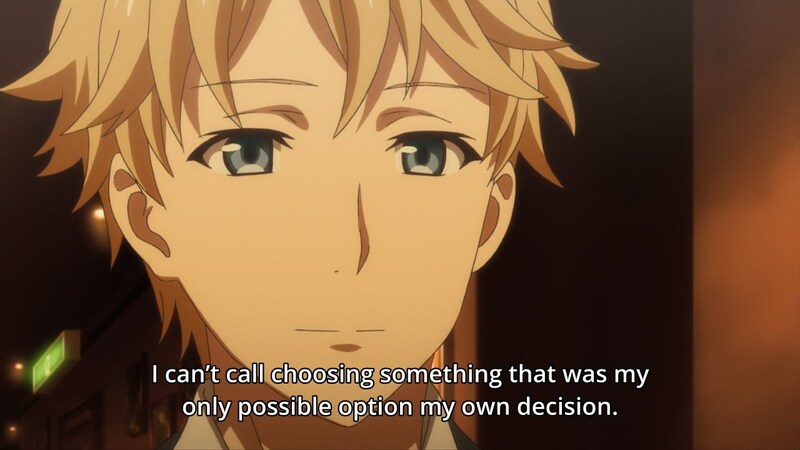 Hachiman overcoming his biggest enemy, his fear, his own self, and comes right out and declares to his friends, to the world, and to himself, the truth he’s been hiding from – that he’s scared of being alone and not understanding others, and that it hurts. And his friends hurt because they suffer from the same issues (Yukino), or because their friends are hurt (Yui). We also had a chat from Sensei where the author took time to explain to us how relationships work, how hurt works, and that once you grow past something that seems all consuming, it doesn’t seem nearly that bad. The author also explained almost every character in that scene, from Tobe and Ebina, to Hayama, to… everyone.